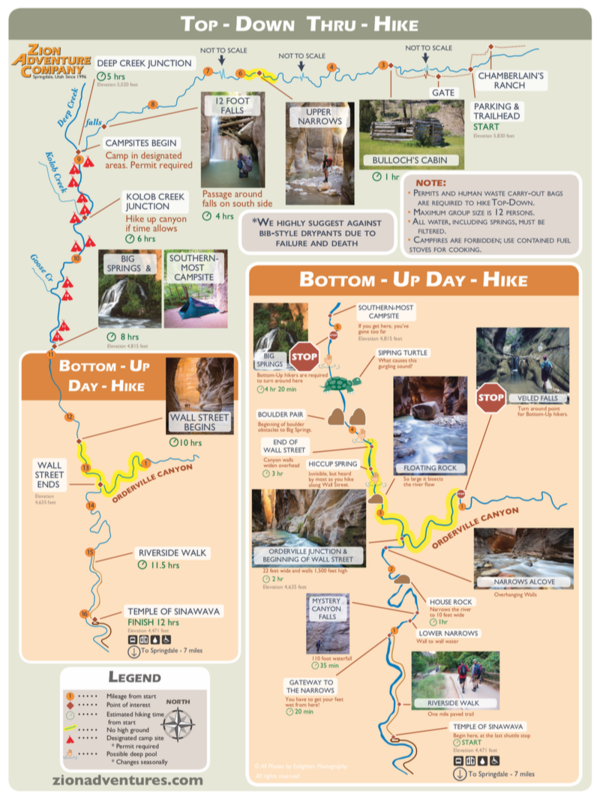 Our seasonal rental packages, combined with our informative Pre-Narrows Orientation video, provides you with up-to-date conditions so that you can enjoy this world-renowned hike safely and comfortably. Zion Adventure Company is proud to be the pioneer of Narrows Outfitting; custom designing equipment so that anyone can hike the Narrows at any time of year. Over the years, we have designed, tested and improved the canyon footwear and drysuits that have become the standard in Narrows hiking equipment. Some choose to hike in their trusted hiking boots or sandals with their favorite backpack, thinking that they will be good enough. Such hikers often return with ruined boots, sore feet, wet phones and soggy, uneaten lunches. Having the right equipment can make or break your day. Recommended equipment is based on water and air temperatures, which vary with the changing of the seasons.